Learn more about how fire sprinkler systems work. Fire sprinkler systems are a great line of defense against commercial building fires, as they are always ready to put a fire out as quickly as possible. Building and property owners know that fire protection is crucial, as the smallest fire can result in significant loss. Learn more about fire sprinkler systems and how they work to keep buildings and occupants safe. What Sets Off A Sprinkler System? Fire sprinkler systems are crucial for protecting buildings from fires as they are active systems, and are ready to go off when triggered. Typically, the system is activated when the air around it reaches 155 degrees or higher. A small heat-sensitive plug sits inside the sprinkler head, and when the air is too hot, that plug shatters and allows water to flow through the system to extinguish the flames below. Fire sprinkler systems act so fast to put out flames and smoke that they help to limit the amount of toxic smoke exposed to occupants and firefighters. Does Every Sprinkler Head Activate? Since fire sprinkler systems are triggered by heat and not smoke, the entire system won’t go off at the same time. This is good news for small fires in large commercial buildings, as property owners don’t want the whole floor or building getting wet when the fire is contained to one room and can be put out quickly. If the fire spreads to other rooms, then each sprinkler will be activated individually to extinguish the flames as efficiently as possible. Fire sprinkler systems are found in various buildings, from retail stores to apartment buildings. 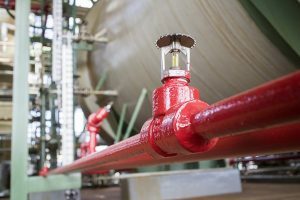 They are a crucial part of a building’s fire protection system, and are one of the best resources for putting a fire out- if they are maintained and inspected regularly. Without regular inspections, the systems may not be working properly in the event of an emergency and will be useless for putting out a fire. Make sure your business is protected by scheduling inspection and testing services with Fireline today. This entry was posted on Wednesday, June 13th, 2018 at 10:52 am. Both comments and pings are currently closed.